Bruce Briney pursues a creative life that intersects the worlds of conducting, performing and teaching. 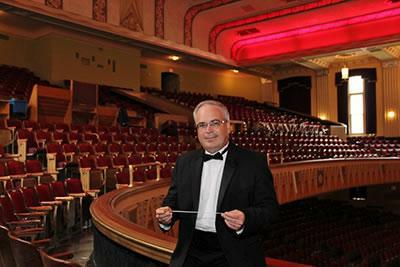 A music professor at Western Illinois University, he was selected as the Music Director of the QSOA in 2007 commencing with the organization’s 60th anniversary season. During his tenure, concert attendance and season subscribers have increased immensely as people have been drawn to the organization’s colorful and engaging programming. The Illinois Council of Orchestras awarded the QSO the 2011 Community Relations of the Year Award for creative artistic collaborations. Last season’s multimedia Beyond the Score® production of Dvorak’s New World Symphony brought record audience numbers to hear the QSO. Briney received his musical education from the University of Illinois and Northwestern University where he earned a Bachelor of Music, Master of Music and Doctor of Musical Arts in Performance. At NU, his conducting teachers and mentors included John Paynter and Victor Yampolsky. His primary teachers in trumpet were David Hickman and Vincent Cichowicz with additional studies with Arnold Jacobs, Ray Mase, Charles Geyer, George Vosburgh, Ray Sasaki and Luther Didrickson. His conducting background includes orchestra, opera, wind ensemble, concert band, brass ensemble and brass band. Recordings of Briney’s work as a conductor and instrumental soloist are represented on the Crystal, Koss, Premiere and RMC labels. Dr. Briney has performed and presented at national conferences including the International Trumpet Guild Convention, the Midwest International Band and Orchestra Clinic, the Texas Music Educators Convention, the Eastern Trombone Workshop, the New York Brass Conference, the North American Association of Brass Bands, and regional College Music Society meetings. Fall 2012 marks the start of Briney’s 19th year as a music professor at WIU. He has received the Outstanding Teaching Award from the College of Fine Arts and Communication, and his students are frequent finalists and winners in the National Trumpet Competition, International Trumpet Guild Orchestra Competition, MTNA state and regional solo competitions and the School of Music Concerto Competition. Recent projects include contributions to Luis Loubriel’s book Back to Basics, and Mark Dulin’s Cichowicz Studies, both focused collections on the life and teachings of brass pedagogue Vincent Cichowicz. Bruce and his wife Robin live in Macomb with their teenage children Paul and Elizabeth and a golden retriever named Bess.